One of the things that has surprised me most since I became a parent is that nursery rhymes still exist. Not only exist, but they are EVERYWHERE. And kids actually LIKE THEM. When I myself was a wee nipper I had a book of nursery rhymes, which disturbingly included one about a child being whipped for sitting too close to the fire, or something along those lines. It was illustrated by a sad-looking red-headed girl, and even at the tender age of four, or however old I was when I used to read that book (I was a precocious reader. I can actually still remember starting school and being really annoyed that there were some other kids who were on higher reading levels than me, just because they were older and had started school before me, and not because they were, like, more intelligent or better at reading or anything. I WAS THE BEST I WAS THE BEST I WAS THE BEST) I realised that that was no way to treat a child. It certainly wasn’t the way I was treated, thank goodness for that. Anyway, times must have moved on a bit as that nursery rhyme appears to have been consigned to the dustbin of history. However, that does not mean that all nursery rhymes are now sanitised, politically correct, right-on Poems of Virtuousness worthy of a weekly column in the Guardian reporting from the frontline of Austerity Britain. Oh no. In fact, there are quite a few that I still have a fair amount of beef with. Let’s start where it always starts, with that old chestnut Baa Baa Black Sheep. Now I know, you knew I would start with this one. You thought I would have a rant about how singling out a black sheep to produce wool for its colonial masters, the “Master” and the “Dame” is racism in the first degree, and just like the Daily Mail you were about to throw your arms up in indignation at the thought that this innocent children’s classic could be brutalised by being renamed Baa Baa Rainbow Sheep in an attempt to mollify all those angry, lentil-weaving Guardian readers and before you know it they’ll be banning Christmas as well! Well, reader, I will disappoint you. I have no issue with the sheep being black. 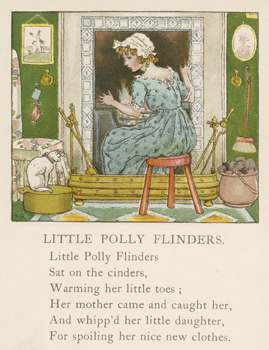 On the contrary, why not have a character in a nursery rhyme who is something other than lily-white. It would make a nice change. The ones who really make me uncomfortable are the “Master” and the “Dame.” It’s just so MEDIEVAL. Who calls themselves a “master” or a “dame” anyway? Who is this sheep giving wool to? Dame Kelly Holmes? Dame Judi Dench? Dame Tanni Grey-Thompson? A pantomime dame? And more importantly, who is the “master?” This smacks of patriarchy to me. Master, indeed! WHY ARE THE MEN ALWAYS ASSUMED TO BE IN CHARGE? It’s like when I got a phone call from a call centre in India trying to get me to claim money for the car accident I had that wasn’t my fault (when? In 1981? BECAUSE THAT WAS THE LAST TIME I WAS IN A CAR ACCIDENT) and they asked to speak to the “Master of the House.” Which would be who, exactly? Piglet? He pretty much does rule the roost round here, if truth be told. And while I’m on the subject, who is this “little boy who lives down the lane?” Why is it always a boy? I must admit, strides are being made in this area, and by strides, I mean the librarian at Wembley Library who does the Saturday morning sing-a-long sessions changes the words to a monstrous tune known as “Three Little Men in Their Flying Saucer” to “Three Little Girls in Their Flying Saucer,” and gives a subversive grin whilst doing it. Go her, I say. That’s progress. And so that brings me to another potentially racist little ditty. I must admit that I thought I had heard the last of that one that goes “with a a knick-knack paddy-whack, give a dog a bone. This old man came rolling home,” but when I heard it at the children’s centre I realised that I was sadly mistaken. Let’s look at this in a bit more detail. “Knick-knack paddy-whack.” What is this about? Because it sounds a lot to me like a racist term for an Irish person. Who is being hit. So this is a song about hitting Irish people. A children’s song about beating up the Irish. Great. And it gets worse. “This old man came rolling home.” Why was he rolling home then? Oh, I see, he was DRUNK. So what you are saying here is that all Irish people are drunk, and get into fights, amirite? And this is a song for children, people. CHILDREN. Next I come to the other one everyone knows about: Ring O Ring O Roses. This is about the plague. THE PLAGUE, ladies and gentlemen. You know that thing that killed, like a THIRD OF EUROPE in the Middle Ages. JOKES. Another one I have an issue with (I know! Another one! Are there any left that we are allowed to sing?) is Rock-a-Bye Baby. Utterly terrifying. Need I say more. My mother also sings one that starts with “Oh dear what can the matter be.” The matter, according to this little ditty, is that “three old ladies” are “stuck in the lavatory,” where they then remain for A WHOLE WEEK. This is at best a very unfortunate turn of events, or worse, elder abuse. So there we have it, all nursery rhymes appear to be invented with the express purpose of either initiating young children into the more unfortunate aspects of the current status quo, or teaching them to be utterly terrified as the world is a very scary place full of violence, pestilence, extreme weather and frankly unpleasant people. Even London Bridge is falling down. You can’t even trust architecture. Or perhaps children need to learn the unfortunate facts of life. It’s not all one big Night Garden out there after all, and we can’t wrap them in cotton wool forever. What do you think? Next Post Piglet Takes First Steps. Mummy Misses It. Indeed. I actually banned my mother from singing it as I was terrified it would give the baby nightmares. One of our tots favourites is ‘Goosey Goosey Gander’ which features a man being thrown down the stairs for not saying his prayers. That’ll teach me to show him youtube videos without watching them first. Ooh I had forgotten that one! I’ll have to try and dig out my old book of nursery rhymes as I’m pretty sure it was full of classics like this…or then again maybe not! Thank you! Yes, there is something brilliant about the fact that a nursery rhyme was invented eons ago about a horrible disease, and yet we’re all still singing it! I’ve always loved nursery rhymes, still do. You are right, though, they are full of disturbing and shameful phrases: these reflect verbal history passed down from generation to generation. Great piece. Ooh, I’d love to know what the banned ones are? Yes, that’s very true. And also a lot of fairy tales are all about reinforcing gender stereotypes, which is another thing I have an issue with. Might have to write an angry post about them as well! Great post. A lot of nursery rhymes and fairy tales are pretty gruesome when you think about them in detail. Hopefully, the children miss the meaning! Let’s hope so-to be honest I don’t recall taking the likes of Baa Baa Black Sheep too seriously as a wee one. Some of them are awful, aren’t they? That said, I don’t know how much children really take in the lyrics anyway. I don’t think I paid much attention! Or…’it’s raining, it’s pouring, the old man is snoring’ (not sure how rain and old men snoring can be linked but never mind) ‘he went to bed’ (but he was already snoring before he got into bed – does that make sense?) ‘and bumped his head, and couldn’t get up in the morning’. He died? It was raining and an old man died? Delightful! I regularly sing this to my boy when it is raining. He thinks it is funny. I am creating a monster. Aha, those are the rest of the lyrics! The only bit I could remember was the old man snoring! I also sing a song that I used to sing at primary school to Piglet when it rains. It goes “I can’t do (insert mundane activity such as going to school/work/leaving the house) today he said, it’s raining, it’s raining again.” So basically I am teaching him that when it rains, the only sensible option is to stay in bed. Honestly, my kids have so many nursery rhyme books and they’re all bonkers. To think I loved these rhymes as a kid. I’m totally with you on the last one. What the heck is the baby doing on top of a tree. Love the Wembley library shout out. Was terribly sad to come back to the UK to visit family this Summer and find that Barham Park library in Sudbury is now gone. Thanks for reading. I’m sure there’s a shop in Wembley High Road called Friends of Barham Park Library which sells (or lends, I’m not sure) second hand books. Oh, there should be a Twitter link at the bottom of each post. I will check. Thanks for letting me know. Yes, they’re bizarre. Another awful one that another commenter picked out is Goosey Goosey Gander, which I’d forgotten about! Hahaha very funny post! The patriarchy! What about that bloody “1,2,3,4,5?” Presumably, you count to 10, so that you can hold up each of your fingers and thumbs in order and teach your child to count. So the person who cruelly caught a live fish (yummy though! ), ensnaring it on a hook, and losing a chunk of their finger in the process, then holds up their bloodied, nightmare-inducing finger to their child, whilst telling them in a sing-song voice, “Because it bit my finger so!”, hideous grin on their face, blood dripping from their oozing wound…!!! Honestly, I could write a book with the amount of mad, bad and simply weird nursery rhymes there are out there. Their entire purpose seems to be to terrify little children!